On January 20th, over 5,000 people turned their back on President Bush at his Inaugural parade. This simple, direct action was taken by people from all walks of life: grade school students and ministers, veterans and artists, union organizers and single mothers, military families and environmental activists. People travelled from every corner of America - individuals by plane from New Mexico, three busloads from Wisconsin, and carloads from Louisiana, to take an action that lasted minutes, but which will reverberate for the next four years. 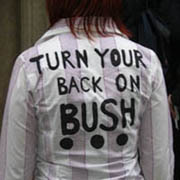 We stand together against Bush's policies: he has turned his back on the ideals that we hold dear, and we're turning our back on him. The last time Carol Shea-Porter had been in the same room as President Bush, she said, her T-shirt's message - "Turn your back on Bush" - won her a push out the door from a Bush supporter as she left an airplane hangar in Portsmouth. 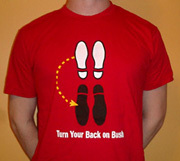 Turn Your Back on Bush was covered on TV stations and in newspapers across the country, and on every continent but Antarctica.